What Podio Triggers and Actions are Supported? New Activity - Triggers whenever there is activity in your stream. New Application - Triggers when you add a new app. New Action - Triggers instantly when an action happens inside an app which you choose. New Organization - Triggers when you add a new org. New Item - Triggers when you add a new item, record or entry to an app (standard or custom). New Workspace - Triggers when you add a new space. New View - Triggers when a new view is added. Update Item - Update an item, record or entry inside an app (standard or custom). Create Item - Create a new item, record or entry inside an app (standard or custom). 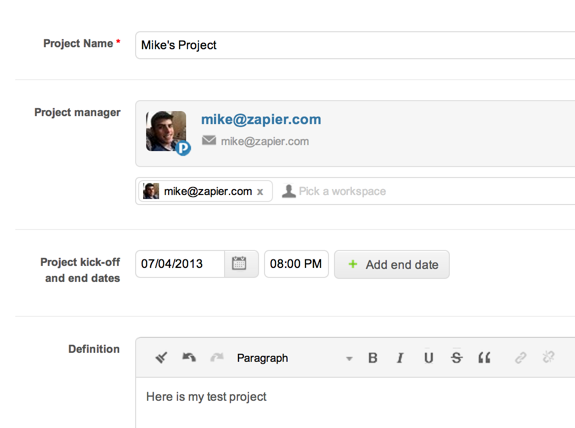 Create Status - Add a status update to a workspace stream. Find Item - Find an item by title in an app. Podio, like many other services on Zapier, makes it quite simple to connect. After you've chosen a Trigger or Action, you'll be prompted to connect a Podio Account to Zapier. You can give the Account a label if you'd like, it is only used inside Zapier, or you can leave the default and click "continue". This window is asking permission for Zapier to access your Podio data. Click "grant access" to finish. That's it! Your Podio Account is now connected to Zapier. You can continue setting up your Zap now. Normally on Zapier, we poll services to look for new information. The speed at which we poll is determined by your plan, but it is usually set to 5 or 15 minutes by default. 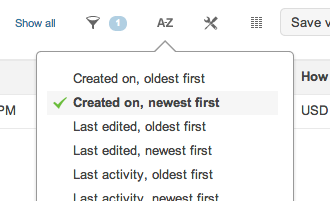 The Podio "New Action" Trigger is a special Trigger which happens instantly. This means Podio pushes data to Zapier instead of Zapier constantly asking for data from Podio. Sometimes, this makes it a bit harder to set up. But you can read below "Dealing with "Fake Data" ..." to learn more about setting up this Trigger. When using Podio as a Trigger, it is very common to see this message pop up when you are Mapping Trigger Fields inside the Zap editor (especially the "new action" trigger). Zapier relies extensively on Sample Data to set up Zaps. We do this so you can be confident your Zap will be sending across the right data. While you don't need to load Sample Data, it is highly recommend for Podio because Podio offers so many similar-but-different fields to choose from. To load Sample Data, click on the "Load real data here." button. More likely than not, you'll be greeted by a popup which will walk you through creating some Sample Data in your Podio account. "But I already have data inside my Podio account!" Zapier relies on a specific Podio API to access your "new action" data which cannot see old actions. Instead, Podio pushes new actions to Zapier. This has the added benefit that your Zap is instant! Next, open up a new window or tab and go to Podio. Navigate to the organization, workspace, and application you chose. 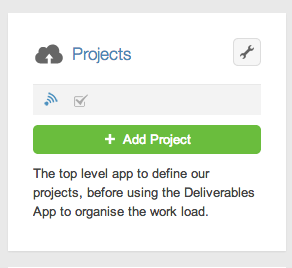 For the purpose of the walkthrough, we're using the "projects" application and triggering off "item.create". Fill out a new project with some dummy fake data. 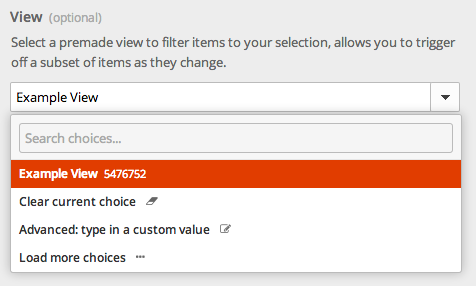 The more fields you fill out, the better, you so can see which fields map to which later inside Zapier. Close the window or tab and switch back to Zapier. You can new complete steps two and three. Click "okay I did this" to continue, then click "get actions" to find the new project which was just created. Wait about 60 seconds and try again. Sometimes Podio is slow to send data to Zapier. 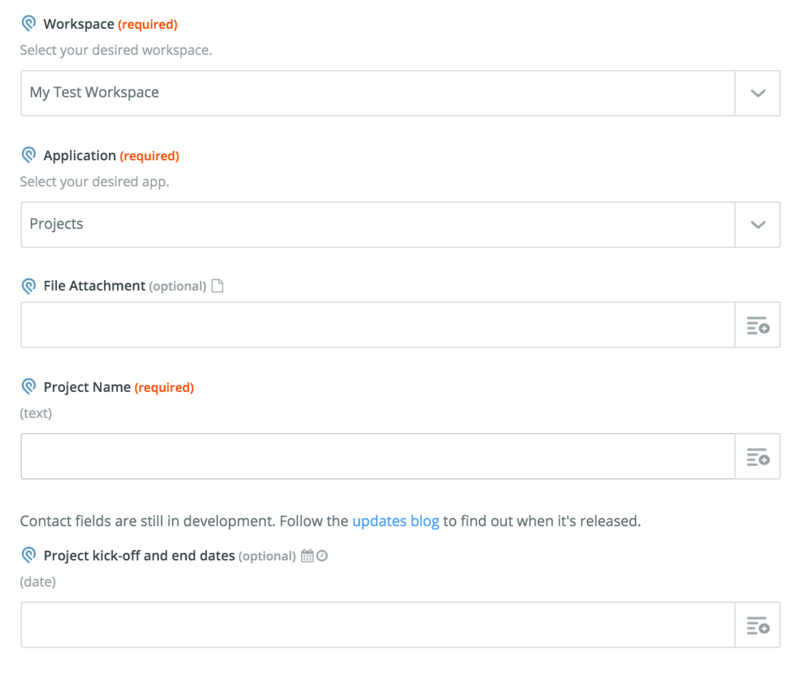 Make sure you are performing the right action inside Podio corresponding to the choices you made in the Zap editor (the right Org, Workspace, and Application). For example, if you selected "item.delete" you will need to actually delete something to push the right Sample Data event to Zapier. Make sure the "missing data" (ie. "We couldn't get any samples from Podio!") 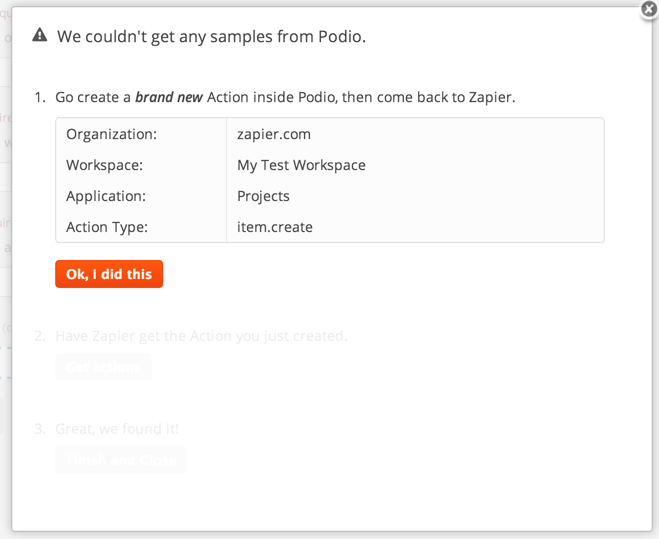 window is open inside Zapier when you are performing the appropriate action inside Podio. If you are following this tutorial exactly, this is already the case. But when debugging it's possible to close the "missing data" window which breaks the link between Podio and Zapier. 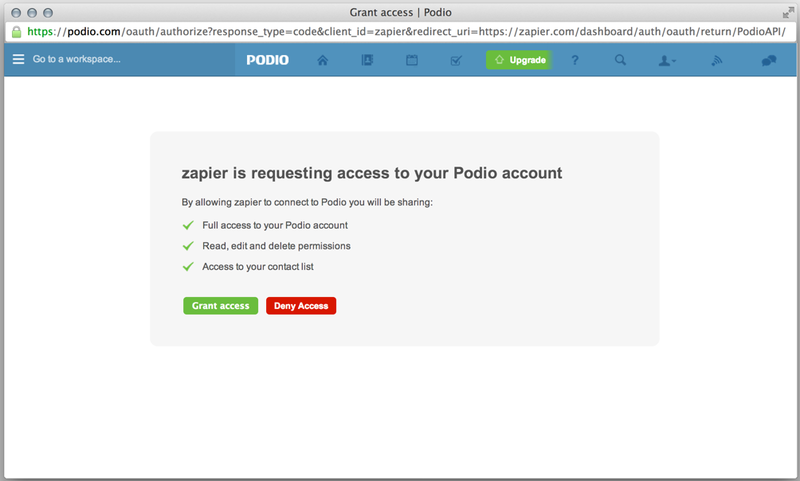 To be clear, the link for Sample Data between Podio and Zapier is only live when the "missing data" window is open. Assuming everything went well, you will be placed back into the Zap editor where you can choose fields, again. This time you should see live sample data from the item you just created along side! Sometimes, you may need to refresh the page to force-reload the fields if the Zap editor is mis-behaving. 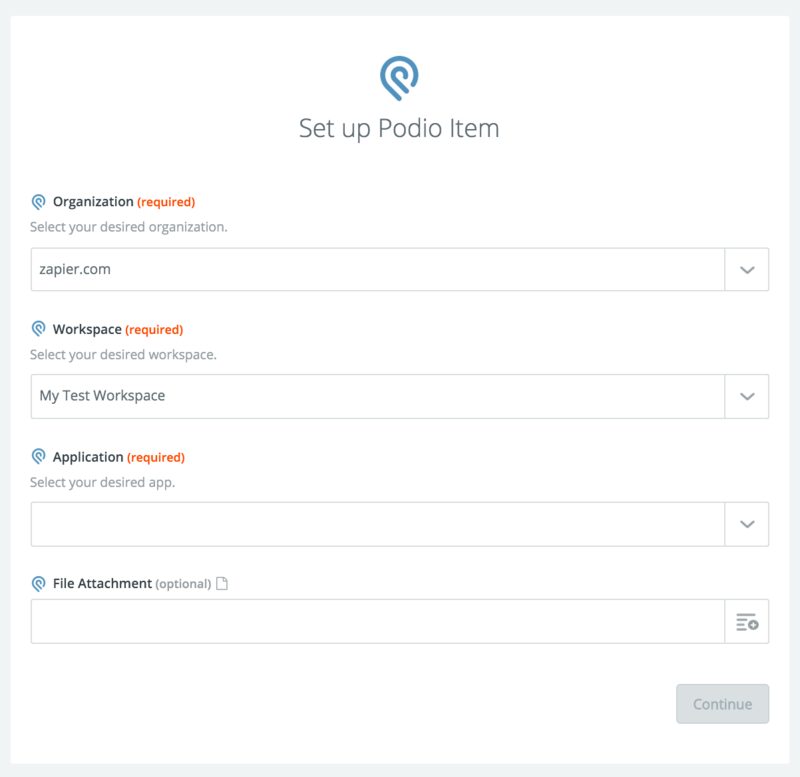 If it is still not working as you'd expect, you may need to go verify a few things on the Podio side to ensure that everything is setup correctly. Go to the application that you are going to send instant events from (in this case, our Projects app) and click on the wrench icon next to the name of it. From the menu, look near the bottom for a developer menu item. Click it to visit the developer panel. Here you should find a section titled "Hooks" and find an entry for the webhook you just created. If it isn't verified, click the verify button. Now, create or update the item to trigger the zap. The verified webhook should now trigger. The Zapier Webhook Service is not currently compatible with Podio in-house webhooks because they require a verification mechanism. However, you can use the Podio "new action" trigger to which subscribes to actions inside Podio automatically via webhooks! You'll get the full power of Podio webhooks by using that trigger. Read Triggering Instantly by using the Podio "New Action" Trigger above for more details. First, you'll need to go look at your items. 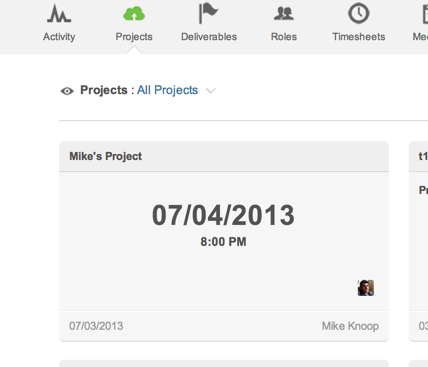 The screenshot below shows a table view, but you can view them in any layout style, table, list, etc...! Next, you'll just select the filters you want to apply to the view. 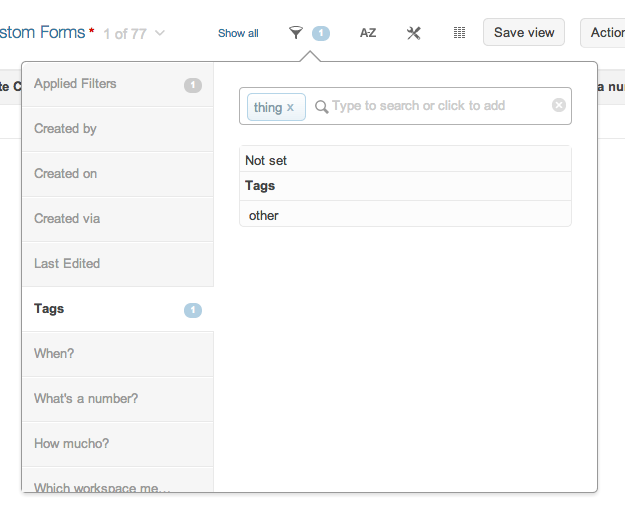 In this case we're only allowing triggers with a certain tag to be viewed (or triggered on inside Zapier). Before you continue, ensure the ordering is created on, newest first. This is important! We're almost done, just click the save button up by the filter, sort and layout buttons to save the view. Finally, swap back to Zapier and select it in Zapier (you might need to refresh the page to make it visible)! The only trigger that has the view ability is the New Item trigger. All other field types are available, though. 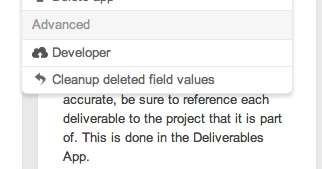 If one of the unsupported field types is marked as a "required" field, Zapier will throw errors. You should either remove the field inside Podio or mark it "optional". This can happen if Zapier gets out of sync with your Podio application, you can fix it by deleting the active hooks. 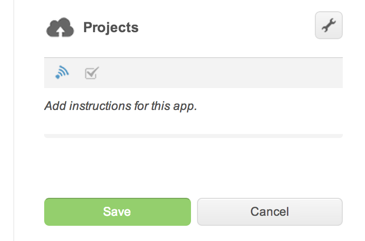 First step - pause all Podio triggers in Zapier.